An Amazon Prime Video app that provides full iPhone X support also brings along a tvOS version to finally provide Apple TV owners video playback from the service without relying on AirPlay. The release of the iOS update for iPhone X compatibility comes at the same time as a native tvOS version. Amazon notes that the tvOS app requires the "Apple TV 3rd generation or later" —but installation may necessitate a reboot of the device, or a reboot followed by a user signing out of iTunes, then back in. A snippet of text in a misfired app description update on Tuesday night heralded the update. 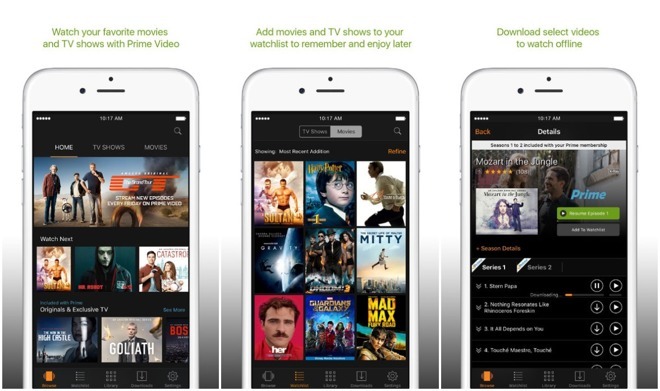 Version 5.0 of the Amazon Prime Video app requires iOS 9 or tvOS 11.2. It is a 76.6MB download. Word of Amazon Prime Video coming to Apple TV first leaked in early May with a report that claimed that Amazon and Apple were close to finalizing a deal. Until Wednesday's release, Apple users wanting to watch Amazon Prime Video and other streaming content needed to rely on Amazon's iOS app, which includes AirPlay support. Amazon ceased Apple TV sales in October 2015, citing potential customer confusion over which streaming devices support Amazon Prime Video. As a result of Amazon Prime Video becoming available, the Apple TV is expected to the marketplace.